I wish I would have discovered the secret to super fast, healthy smoothie prep years ago! Recently, I discovered the technique of freezing my smoothies in ice cube trays in the freezer. When you are ready to make a quick smoothie, all you have to do is pop some cubes out into a Magic Bullet cup and add some water. No more chopping, measuring, or cleaning, and you have your smoothie ready in seconds. 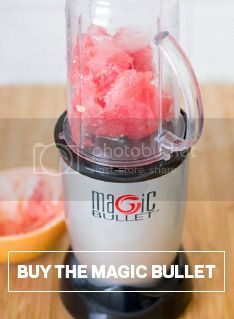 Add all ingredients to a Magic Bullet blender and blend well. Pour into ice cube trays and freeze until ready to use.